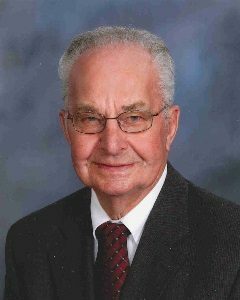 Clarence Zebell, age 96, of Glencoe, passed away Monday, January 28, 2019, at Glencoe Regional Health Services in Glencoe, Minnesota. Funeral Service will be held Saturday, February 2, 2019, 11:00 A.M. at St. John’s Lutheran Church in Plato, Minnesota, with interment following at the church cemetery. Visitation will be held Friday, February 1, 2019, from 4:00-7:00 P.M. at St. John’s Lutheran Church in Plato, Minnesota and will continue one hour prior the service at the church on Saturday. Clarence Herman Wilhelm Zebell was born on June 28, 1922, in Bergen Township, Minnesota. He was the son of Emil and Laura (Tonn) Zebell. Clarence was baptized as an infant on July 23, 1922, by Rev. Baumhoefener and later was confirmed in his faith as a youth on April 5, 1936, by Rev. Schert both at St. Peter’s Lutheran Church in Bergen Township, Lester Prairie, Minnesota. Clarence’s confirmation verse was 2 Corinthians 12:9. He received his education at a country school thru the 8th grade. On June 30, 1950, Clarence was united in marriage to Violet Oltmann at St. John’s Evangelical Lutheran Church in Helen Township, Glencoe, Minnesota. Clarence and Violet made their home in Plato and Glencoe. This union was blessed with three children: Craig, Laurie and Patti. Clarence and Violet shared over 68 years of marriage. Clarence worked at the Plato Feed Mill in Plato and was the maintenance man for the City of Plato. After he retired, Clarence mowed lawns for others. He was a faithful member of St. John’s Lutheran Church in Plato where he served as a trustee and usher. Clarence enjoyed woodworking and tinkering with items. He loved to watch the Wheel of Fortune and listening to polka music. Clarence treasured the time spent with family and friends. Clarence passed away on Monday, January 28, 2019, at Glencoe Regional Health Care Center in Glencoe, Minnesota, at the age of 96 years and 7 months. Clarence was preceded in death by his Parents, Emil and Laura Zebell; Sisters, Luella Graupmann and her husband, Hillard, Viola Kohls and her husband, Walden, Elaine Latzig and her husband, Melvin; Brothers, Leonard Zebell and his 1st wife, Leona, and his 2nd wife, Barb; Sisters-In-Law; Brothers-In-Law. So sorry to hear Clarence passed. I will miss seeing him in church. Prayers for peace for your family asClarence is now at peace and flying high. So sorry to hear about Clarence. Our condolences to all of your family.